The first shows Road Engines and Kerr delivering a 40-ton transformer to the Loch Tummel power staion in Perthshire in 1930. Kerr’s owned four McLaren Road Locomotives which they had purchased from the War Department at the end of WWI. They had a habit of switching around registration plates so identifying their McLaren’s in any pictures of their activities is difficult, and in this picture no registration plate is visible so an identification is not possible. The four they owned were McLaren 595 of 1897, McLaren 1594 of 1917, McLaren 1600 of 1917 and McLaren 1627 of 1918. 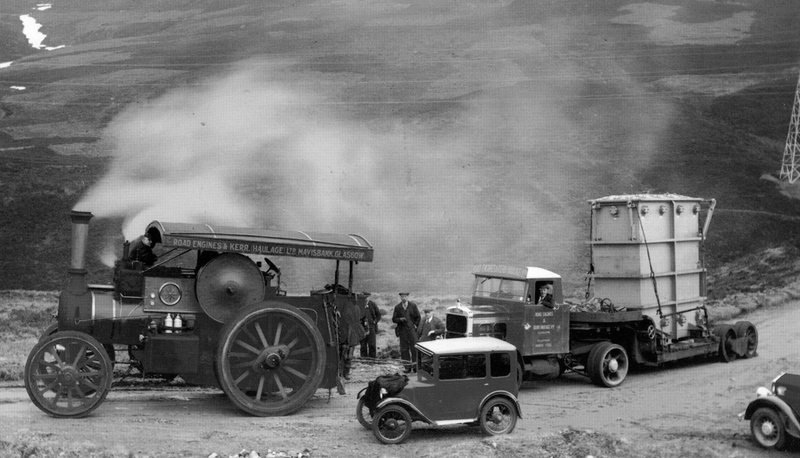 The engine is assisting a chain driven Scammel with the load. 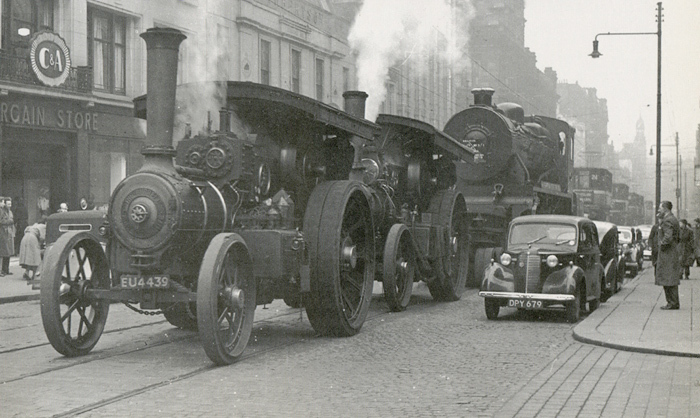 The second picture is taken 17 years later in 1947 and shows their engines Burrell 4092 ‘Simplicity’ and Fowler 20223 ‘Supreme’ hauling a railway engine built at the North British Locomotive Company through the streets of Glasgow. The was destined for the Egyptian State Railways, Kerr’s undertook a number of jobs like this and there are various pictures in existence. Both engines were of course former Showman’s engines built for the Deakin fairground family in Wales, both also hold the distinction of being the ultimate showmans engines built by their respective companies. I am trying to piece together a history of this interesting firm to post online a some point in the future. This entry was written by David Collidge, posted on 26 February 2010 at 10:34 am.